Tinning is a process of using a soldering iron to melt solder around a stranded electrical wire. Tinning the tips of stranded wires holds the fine wires together and makes it easy to connect them to screw terminals or other connectors. This also ensures that all of the wires are making an electrical connection. To tin electrical wire properly, you must use the right type of solder and follow a few basic tips and techniques. Note that there is no "tin" involved in tinning. The only material used is electrical-grade solder (explained below). When heat is applied with a soldering iron, the solder fills in the voids between the wire stands, creating one solid wire that can be easily bent and placed underneath terminal screws. This ensures a tight connection and virtually eliminates the possibility of loose wire strands touching the junction box or coming out from beneath the terminal screw. The best solder to use for tinning stranded copper wire is electrical-grade rosin-core solder. This is an acid-free solder that contains a flux in the core of the solder. Never use solder that contains acid, which can damage the wire or its insulation. If you use a different type of acid-free solder, you may need to apply flux to the wire as part of the soldering process. Soldering must be performed with caution! The soldering iron gets very hot and can cause severe burns. Always place the soldering iron on a heat-resistant surface while it heats up and cools off. While soldering, always works above a heat-resistant surface and away from anything flammable. Be careful not to overheat the wire and melt the wire insulation. It's a good idea to practice soldering using scraps of the same wire you will solder for your project. Plug in and turn on the soldering iron, and let it heat up. Quickly wipe the tip of the soldering iron on a damp sponge. This removes any oxidation that may have occurred while the iron was heating up. Extend the solder from its spool in a straight line. If desired, clamp the wire in a "third hand" tool or similar heat-resistant holding device. Touch the tip of the solder to the tip of the soldering iron to create a small pool of liquid solder on the iron's tip. This will help conduct heat to the wire. Touch the tip of the soldering iron to the bottom side of the wire so the solder pool is in contact with the wire. 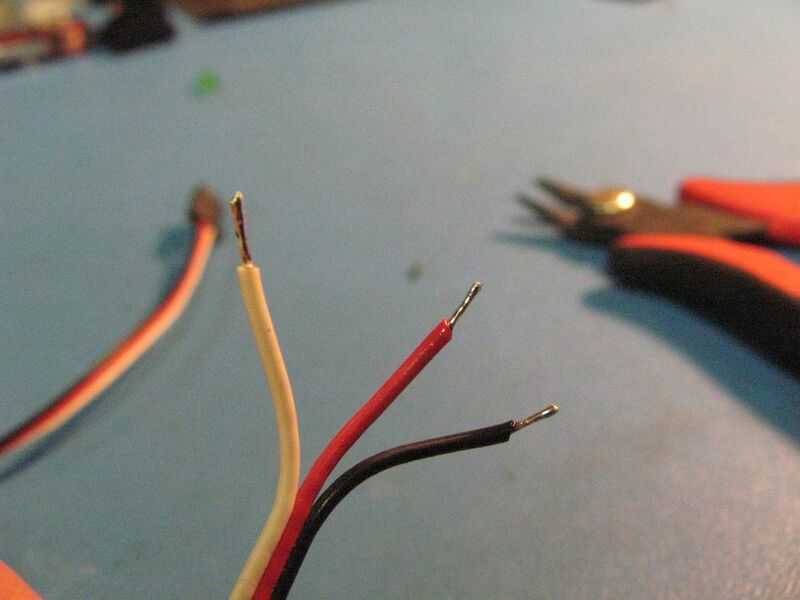 Apply the solder to the top side of the wire, opposite the soldering iron's tip. The solder should melt and be drawn in around the wire strands. Move the solder and soldering iron together along the bare portion of the wire, melting the solder as you go. Let the solder cool, then inspect the results. The solder should create a thin coating all the way around the wire and should not form a glob or heavy bead, which creates electrical resistance. Usually, the wire strands are visible under the solder. If desired, use needle-nose pliers to bend the tinned wire into a candy-cane-shaped hook that easily wraps around the screw terminal on devices like switches and receptacles.